“Innovation and enterprise are essential activities at UCL”, President and Provost Michael Arthur told the audience at an enterprise awards ceremony held on the Bloomsbury campus on Tuesday. Speaking at the UCL Awards for Enterprise and Entrepreneurship 2017 - designed to recognise and celebrate the success of UCL students and staff in a range of enterprise and entrepreneurship activities - Professor Arthur said enterprise should be considered on equal terms with research and education. The UCL Provost’s Spirit of Enterprise Award was won by staff from the Department of Electronic and Electrical Engineering. It recognises the achievements and approach of UCL staff, teams or partnerships that have demonstrated a real spirit of enterprise at UCL. Four other nominees in this category received commendations for outstanding work in their fields (see full list of winners and commendations). The Provost also presented the Farha New Venture Awards, funded by a generous donation from UCL alumnus and philanthropist George Farha (Chemical Engineering, 1991). 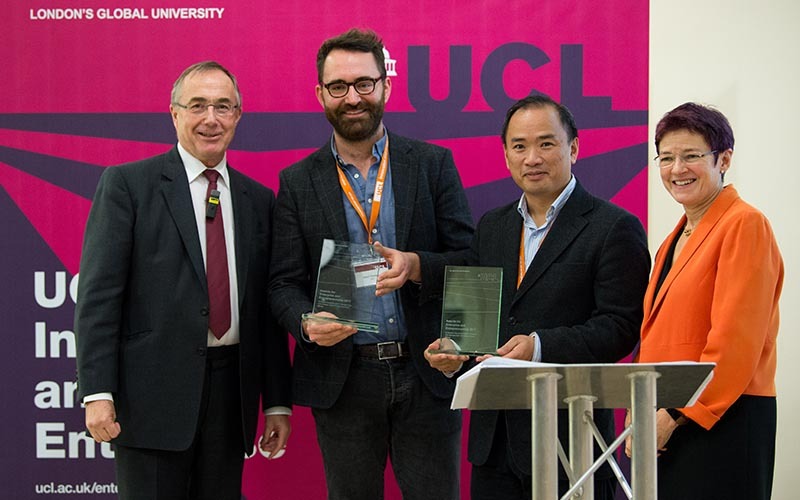 These awards, designed to recognise promising businesses emerging from UCL undergraduate and postgraduate students, staff and recent graduates, went to four startup businesses and social enterprises (see full list of winners and commendations). All had completed the ‘Launch - £10,000 challenge’ summer pre-accelerator programme. The winning startups ranged from a digital personal finance manager tailored to the needs of older people to a social network dedicated to youth football players.